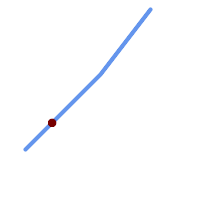 Returns a point interpolated along a line. First argument must be a LINESTRING. Second argument is a float8 between 0 and 1 representing fraction of total linestring length the point has to be located. See ST_LineLocatePoint for computing the line location nearest to a Point. Since release 1.1.1 this function also interpolates M and Z values (when present), while prior releases set them to 0.0. Changed: 2.1.0. Up to 2.0.x this was called ST_Line_Interpolate_Point.